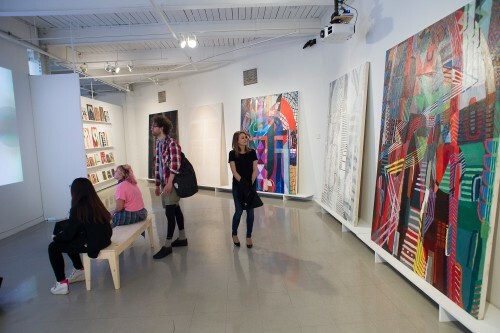 Monday – Saturday: 10 a.m. – 5 p.m. Sunday: 12 p.m. – 5 p.m.
Meyerhoff Gallery (3,000 square feet / 294 linear feet) is located in the Fox Building, a former shoe factory converted into an academic building in 1980, with offices, classrooms, and studio spaces. The Meyerhoff Gallery is home to major exhibitions by local, national, and internationally known artists. It is one of a number of sites for the annual Faculty, First Year Experience, and Commencement exhibitions. Meyerhoff Gallery was dedicated in 1981 in recognition of the interest, leadership, and generosity of Robert and Jane Meyerhoff. Mr. Meyerhoff served as vice-chairman of the effort to open the Fox Building, while Mrs. Meyerhoff, who was actually born in the hospital, co-chaired the campaign to renovate Mt. Royal Station into a MICA academic building in the 1960s.